Much like Earth, Venus has an ozone layer high in its atmosphere, according to new data received by the European Space Agency. 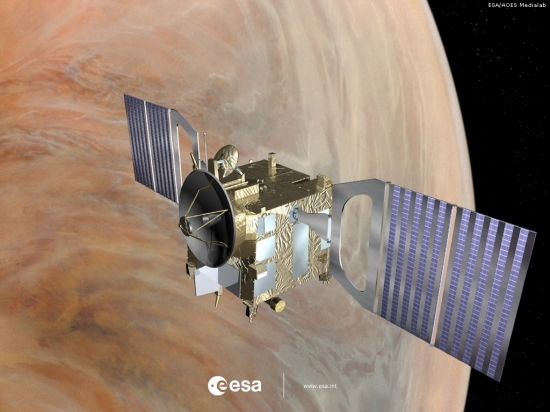 The ozone was detected by instruments on the agency's Venus Express spacecraft. Ozone is a molecule consisting of three oxygen atoms. Ozone in our own atmosphere plays a crucial role in protecting us from a significant portion of the damaging ultraviolet light from the sun that bombards Earth. Computer models indicate that Venus' ozone is produced through the action of sunlight striking carbon dioxide in the atmosphere of our neighbor planet. "This detection gives us an important constraint on understanding the chemistry of Venus' atmosphere," says Franck Montmessin, who led the research. Until now, ozone has only been detected in the atmospheres of Earth and Mars. On Earth, ozone is believed to be a byproduct of life itself. Plants and microbes continuously contribute to Earth's atmospheric oxygen. On Mars the tiny amount of ozone is believed to be due not to oxygen produced by life, but by the action of sunlight striking carbon dioxide molecules in the upper atmosphere. Scientists assume that Venus' ozone is also the result of this non-biological process. Astrobiologists theorize that atmospheric ozone must reach concentrations at least 20 percent of Earth's ozone layer for it to be likely that the ozone is a result of biological activity. Venus' ozone concentrations are well below this theoretical threshold. While there is probably no life on Venus, the discovery of an ozone layer in Venus' atmosphere yields other clues to Venus' cloud-shrouded mysteries. "This ozone detection tells us a lot about the circulation and the chemistry of Venus' atmosphere," says Hakan Svedhem, ESA Project Scientist for the Venus Express mission.